Autumn’s coming on so fast Winter seems to be breathing down our necks, though we don’t usually get the first frost till November. Last night however was cold. Dinner outside under the stars is still the more attractive option, but even with a jacket over a trainer over a T-shirt we were huddled up near the fire, sipping shochu with hot water and inhaling the wood smoke. I had a sore throat the next morning. Last week I noticed a papaya plant had sprouted from last year’s compost heap – get it through the winter in a pot and it should grow quite big in the garden next year. But I forgot to dig it up, and this week the deer had got in first and chewed all the leaves and top shoot off. Drat. 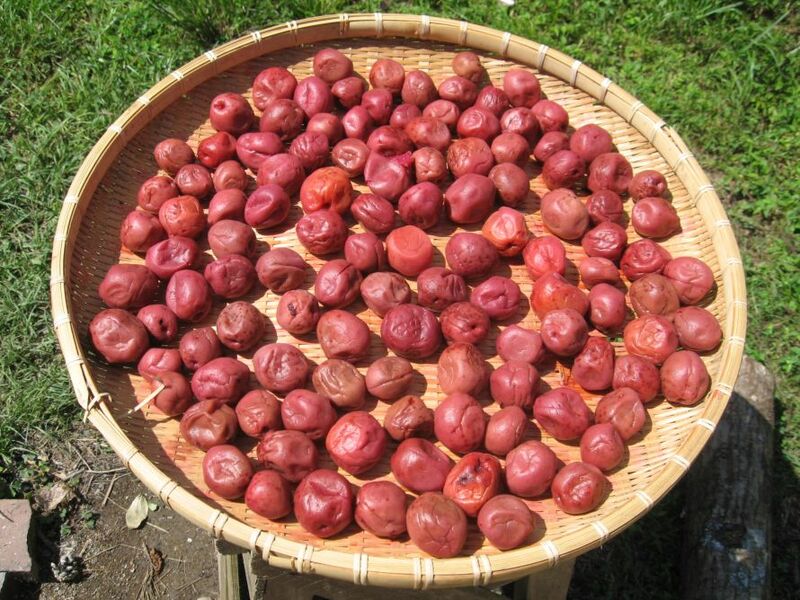 T. was busy taking advantage of the hot sun and dry breeze to dry her umeboshi pickles. About half done now. The home-made ones are definitely good, and cheap if you don’t count the labour. Umeboshi pickles drying in the autumn sun.